Dichisurile Ralucai: Luxembourg - "Knotted gun", a small sculpture with an important message! 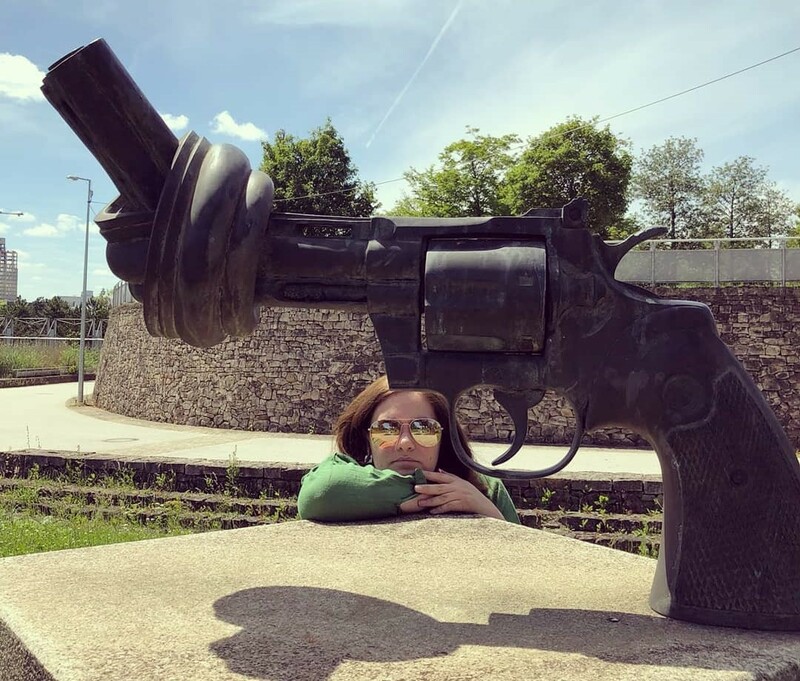 Luxembourg - "Knotted gun", a small sculpture with an important message! I am writing this post for that one person who might look for this sculpture in Luxembourg. I've passed by it every day while it was in its former location, but when it moved it was sort of a witch hunt, because cultural news are still written in other language than English, in Luxembourg. So much so, that if you search for it today you will find only articles related to the death of its author and not its location. So what am I talking about? The Knotted gun or the Non-Violence sculpture was made by the Swedish artist Carl Fredrik Reuterswärd after John Lennon was murdered. It is a Colt Python .357 Magnum revolver with a knotted barrel and the muzzle pointing upwards. Luxembourg, or to be exact the European Commission, owns one of the 22 originals. Also Luxembourg is related to that first one sculpture that the artist made, because the Luxembourgish Government donated that sculpture to the United Nations in the 80s. Nowadays, the sculpture is in Kirchberg park, a very nice find which goes to show that you can live for almost 6 years in one tiny place and still have a tone of things to discover. The park is close to Coque Centre and the sculpture is in the middle of it together with other sculptures. I only wish the Touristic Centre would organise the Art tour in Kirchberg, cause I for one am fascinated by the works of art that this place encapsulates. Here you can see its place in the park. Basically the sculpture in the back is tall enough for you to spot it in the distance, walk towards it, brace the grass and you will find the Knotted Gun. In this day and age when the aggressivity turns so quickly into violence, the message this tiny sculpture is bearing is more important than ever. The gun is cocked, but the knot makes it clear it will never shoot. If you want this is a plea to think before acting, to filter all information and have an open mind! Ce reprezintă cămășile românești pentru mine?